Enjoy an extra night on us. Stay 3 eligible nights at a participating Hyatt Regency hotel and you could get your 4th night free when you select 4 consecutive nights. Stay 3 nights, receive the 4th Night Free offer is only available for eligible stays between March 13, 2019 and May 15, 2019 that are booked by May 11, 2019. Offer only valid at participating Hyatt Regency hotels on qualifying stays. Reservations subject to availability. Offer only available for a limited time, while shown as available on the applicable Hyatt website. Offer only available if booked online by clicking on the then-available offer (if any); any limitations or restrictions included in the published offer shall apply. Guest must use free night during stay in which it is earned and stays must be completed by May 15, 2019. Guest must check out on or before May 15, 2019 to be eligible for the offer. Guest will forfeit any unused portions of this offer. Free night will be forfeited if you have an early departure or otherwise do not meet the minimum stay requirements outlined in the published offer. Free night reflected at time of booking, no further discounts will be made. The complimentary fourth night is available with eligible three consecutive paid nights. Offer excludes any applicable taxes, food, beverage, resort fees, service, casino, or incidental charges and gratuity. World of Hyatt® Base Points and Tier-Qualifying Night credits will not be awarded for the free night (if applicable). Guest is responsible for all charges exclusive of this offer. Additional charges may apply for additional guests or room type upgrades. The availability of offers at and travel to and from certain destinations may be subject to government approvals, regulations, restrictions or applicable taxes. Offer is not replaceable if lost, destroyed, stolen or expired, and void if altered, photocopied, reproduced, copied, purchased, sold or otherwise transferred. Not valid with Family Plan rooms, group travel, conventions, other promotional offers or certificates, tour packages or special rate programs. Not redeemable for cash or other substitutions. Any unauthorized transfer, sale, distribution or reproduction constitutes fraud. Hyatt reserves the right to request a form of security deposit in advance for expenses not covered by this certificate. Offer cannot be exchanged or reissued. User is responsible for and must make any required disclosures regarding any benefits received in connection with this offer. Offer not valid in conjunction with previously booked or held stays and may not be combined with other offers or rate plans. All length of stay offer hotel reservations require full, non-refundable prepayment at time of booking. Kids eat dinner free and play free golf with a paying adult. For a summer that needs no planning, join us for carefree days, blue skies, sunshine and fun-filled activities. Our 2.5 acre water playground provides everything you need for daytime fun; a white sand beach, ten pools, three-story waterslide, poolside activities and by night, Dive-in movies and Cosmic Nights. There’s no need to leave the resort, as kids eat dinner free and play free golf with a paying adult. As nightfall comes to the desert, relax in Center Stage Bar with spectacular views of the McDowell Mountains, cascading fountains and live nightly entertainment. It’s that simple! The only plan you need to make this summer is to book your stay at Hyatt Regency Scottsdale Resort & Spa! 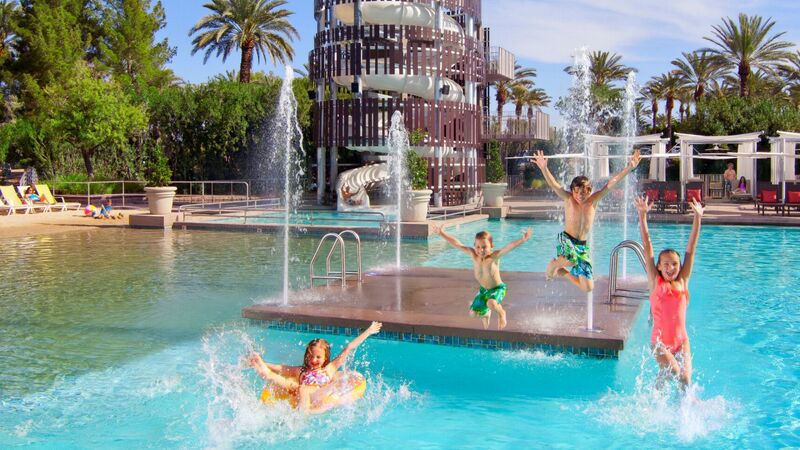 Offer valid for reservations made between 03/27/2019 and 08/25/2019 for stays from 05/28/2019 through 08/26/2019 at Hyatt Regency Scottsdale Resort & Spa at Gainey Ranch.Package includes: Kids Eat Free Dinner from the kids menu in SWB or Alto for ages 12 and under with a paying adult per day. Kids ages 18 and under play one round of golf free per day with paying adult. Package inclusions are subject to availability and must coincide with guest’s stay at Hyatt Regency Scottsdale Resort & Spa at Gainey Ranch. No credits may be used towards alcoholic beverages. A limited number of rooms are allocated to this offer; reservations subject to availability. Offer not valid with groups, conventions, other promotional offers, tour packages or special rate programs. Rate is per room, per night, based on double occupancy and excludes service charges, mandatory resort fees, applicable taxes and other incidental expenses. Additional charges may apply for additional guests or room type upgrades. Guest is responsible for all charges not included in package. No refunds for any unused portion of package. No substitutions nor replacement services or products offered for package inclusions. A portion of the rate for this offer may reflect taxes, service charges, gratuities, and third-party charges for certain included items, and those costs are not eligible for World of Hyatt® points. Promotional blackout periods may apply due to seasonal periods or special events, and normal arrival/departure restrictions apply. Hyatt reserves the right to alter or withdraw this offer at any time without notice. The trademarks Hyatt®, Hyatt Hotels & Resorts®, Park Hyatt®, Grand Hyatt®, Hyatt Regency®, Andaz®, Hyatt Centric®, The Unbound Collection by Hyatt™, Hyatt Place®, Hyatt House®, Hyatt Ziva™, Hyatt Zilara™, World of Hyatt™, Hyatt Residence Club® and related marks are trademarks of Hyatt Corporation or its affiliates. ©2018 Hyatt Corporation. All rights reserved.